Imagine a “green” building, one which is energy efficient, uses resources wisely, and generates some of its own services on site. The image in your mind probably includes many standard elements codified into the design vocabulary of sustainability, i.e. structures that would not be out of place in a Pacific Northwest winery, with louvered extensions, overhangs and brackets, reclaimed wood, and vaguely industrial finishes… the woody station wagons of architecture. 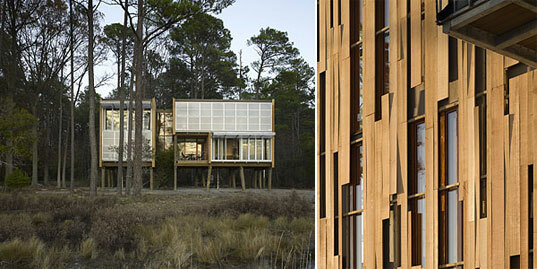 In truth, a sustainable building can look like any other building that is designed for its place. The steep-pitched roof of the Alpine chalet, the flat roof and mud-brick of the Middle East, the Victorian shotgun in New Orleans, Richard Neutra in Los Angeles – each has an aesthetic limit that transcends the inherent qualities of the place to create architecture, or even Architecture. The development of building certification standards such as LEED or Passive House have supported contemporary design as an expression of sustainability. (If it looks weird “at least it’s sustainable!”) Many architects have justified modern designs under the guise of environmental design (mea culpa), however, green buildings may take traditional forms as easily as they reflect contemporary styles. Not one of the certification programs has a built-in aesthetic, but there is a cultural expectation that sustainability equals “difference.” Odd, then, that this celebration of difference has resulted in such strong visual coherence. The value of this distinction may be didactic – the building may guide users and visitors to change their behavior, adjust to a wider variation of temperature, use lighting more sparingly, or turn off the water. The sustainable revolution is evolving, and sustainability is no longer the highest target. The definition of sustainable means it can maintain the status quo, and the status quo is not enough anymore. The radical architecture goes beyond sustainability to become regenerative, which really does change the forms and materials, and thereby defines a new aesthetic: No more hard surfaces – the new building envelope creates pockets for habitat to restore biodiversity. No more concrete connections – accessibility must be met through pervious cells. No more formal plazas and gardens – wastewater treatment zones will be installed within their footprint. No formal street frontage, unless streets are oriented to capture solar insolation. No more pure geometries – they are replaced with the layering of services to reach net-zero or net-positive standards. The flamboyantly regenerative building cannot hide behind a pre-defined aesthetic.